Recently I received a packet of USB Rechargeable LED Safety Lights from Bright Outdoors for review. 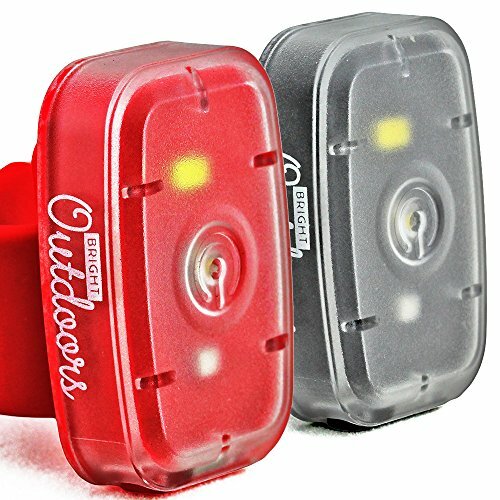 I asked to review these lights because I saw that they are small, have 4 lighting modes and three different ways to attach to just about anything.You can clip and wear them on your garment or runners armband or attach them to just about anything, like your dog leash, purse, bike, stroller,etc.. The lights slip over silicon and velcro attachments (2 sets) which makes it easy to wrap or attach to any surface. These small lights are very lightweight and measure 1.75"x1.2" and ½ oz. They come with lithium ion batteries and two USB chargers . Besides having a bright white light, the light can be changed to flashing light mode as well, which is great in case of emergencies when you need to attract attention. To activate the different light settings, push the center of the light. One push starts the strobe setting, a second push turns the light to a constant red and a third push activates red flashes. The fourth push turns on the white light and pressing and holding the light for a few seconds shuts the light off. Overall I think that these lights are great. Holding a flashlight becomes cumbersome at times and that's why these lights are really cool the way they can be attached quickly to just about anything.